Oregon Mushrooms heads out into the woods every year to bring back a variety of fresh wild mushrooms for your enjoyment – we’ve made mushrooms our passion and we want to feed your passion for them too! In addition to a fantastic selection of fresh mushrooms sold on the Oregon Mushrooms website, we offer a number of other delectable treats that food lovers are sure to enjoy. Are you searching for porcini powder? Interested in flavoring your favorite dishes with truffle oil? Do you want to see the exciting new flavors that artisan salt can add to your food? Take some time to browse the rest of our website and see the fantastic selection of products that we have available. From porcini oil to dried spices, you're certain to find something new and exciting. We gather and collect our mushrooms according to what’s in season for optimal freshness and aroma. For approximate seasonal availability of the fresh mushrooms we seek out, feel free to consult the following list for our earthy delights. If we don't carry a certain type of fresh mushroom on our website, ask if we carry it. 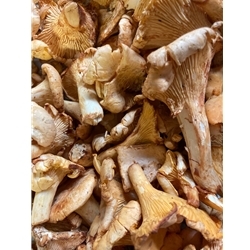 We sell other mushrooms that are not on the website, for example: Fresh Honey Mushrooms, Fresh Fried Chicken. For certain types, such as fresh shitake, there is a minimum amount to order. If you’ve missed the season or the season has yet to come for the fresh mushrooms you have in mind (e.g. matsutakes), give our dried matsutake mushroom selection and any of your other favorites a try. You won’t be disappointed. We also do wholesale. Please contact Scott Cossairt at 541-850-6194.